if they place an order* before the 28th March 2013. Hurry only 5 x Large and 5 small eggs are being offered. 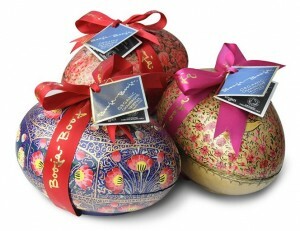 These hand-made Easter eggs are created in Kashmir using paper mache with a hand-painted, varnished finish. This gourmet Easter egg is available in both Large 150g (13 truffles) and Small 37.5g (3 truffles). The Easter egg contains Booja Booja’s award winning, dark chocolate, Organic Champagne truffles. Each pretty egg is unique (as the image above shows) and designs do vary so it is not possible to request a particular colour or style. A truly unique Easter egg gift. Booja Booja from Norfolk in England make award winning, chocolate truffles of superior quality. All their chocolate truffles are organic, vegan, dairy and gluten free.